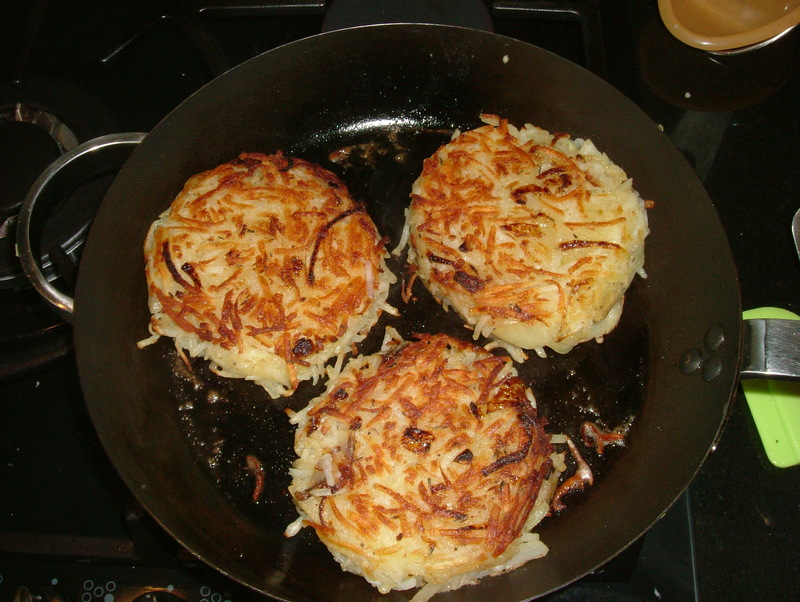 I have tried various ways of making rösti over the years and this for me is the easiest and tastiest method. 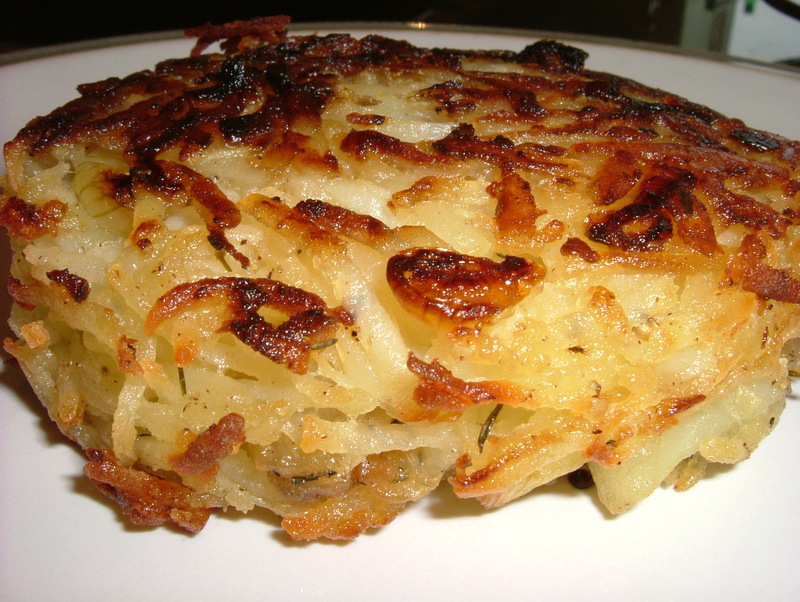 Most recipes suggest using raw spuds and squeezing the starchy liquid from them in a teatowel – this has never worked for me and the centre of the rösti remained quite slimey. Perhaps this is because I like my rösti thick rather than thin and crispy. I use parboiled potatoes and leave them to cool down completely before grating. You can also use left-over spuds from the day before provided they are not too soft to grate. 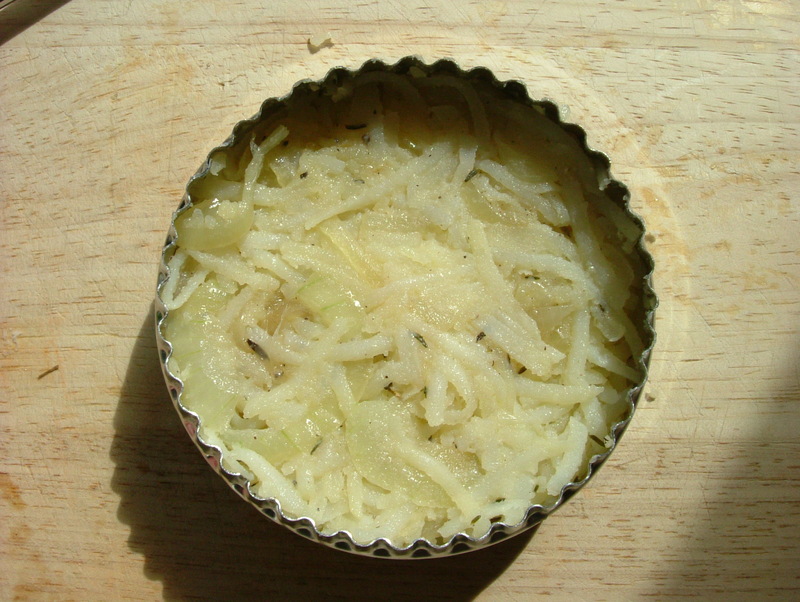 6 medium potatoes, parboiled (for 5 minutes after reaching boiling point), cooled and grated. 1 medium onion, finely sliced. 1 tablespoono of chopped thyme. Teaspoon each of salt and pepper. Grate the parboiled potatoes in to a large bowl (I used the grating blade of a food processor but you can do this by hand). Heat one tablespoon of olive oil in a frying pan on medium heat and add the onion, frying until lightly golden, stir in the thyme and then add the onions to the potatoes and mix well. Melt the butter and add this to the potato, add salt and pepper and stir well to ensure well mixed. Clean your pan with a piece of kitchen paper and heat a tablespoon of olive oil on medium heat. 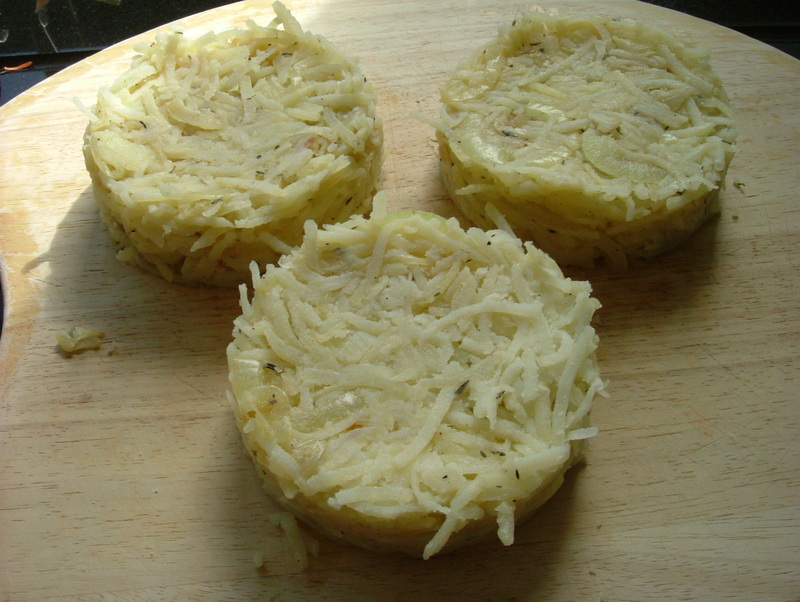 Using a large round pastry cutter shape your rösti, pressing down to ensure the mixture is tightly packed. Carefully lift the rösti using an flat egg-lifter and place in the frying pan (you will probably only have room to do 2/3 at a time) and leave to fry for 5 minutes on one side until crispy and golden before carefully turning the rösti and frying the other side, again until crispy and golden. At this stage you can either remove the rösti and allow to cool and refrigerate until you want to use them or you can place in the oven straight away to finish – preheat the oven to 180ºC and place the rösti on a baking tray and cook for 20/25 minutes until cooked through. If I make 4, do you reckon I could freeze the extras? Glamazon, made this recipe tonight and it was delicious…I forgot to season but even still they turned out really well and so easy when you use a food processor. Thank you! Hi there – thanks for the feedback! Always lovely to hear that a recipe works for someone else too. You have reminded me it’s been a while, I really need to make these again 🙂 Glad you enjoyed. I lived in Switzerland for some time and this is a meal to top all meals. I just love it. Will try your recipe over the weekend. Hi there. Love Rosti – nice topped off with a poached egg too. Hi – I’m afraid I can’t be much help to you – this is wordpress 🙂 best of luck in your search.